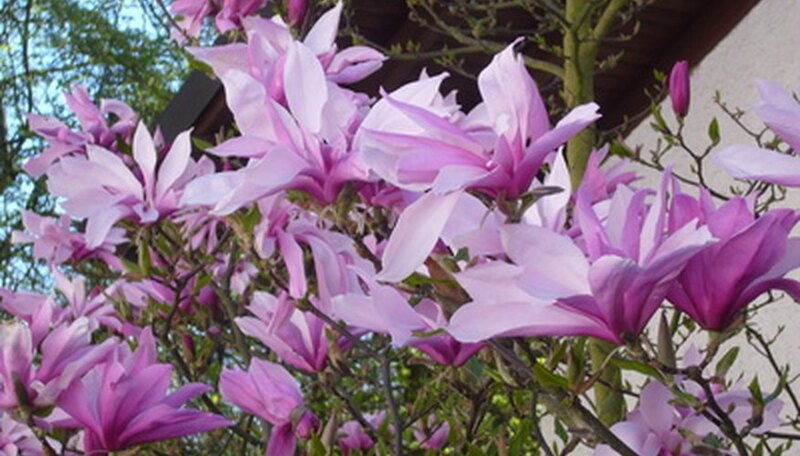 Purple flowering trees bring a rich dimension to the spring garden landscape. Their cool blooms contrast refreshingly with warm-colored spring bulbs like yellow daffodils and orange tulips. Since purple is a mix of blue and red, it also harmonizes with blooms of those colors. Planted as stand-alone specimens, these trees provide a soothing palette of purple blossoms against green foliage. Many of them also brighten the garden with fall color. Paw paw (Asimina triloba) is a small--10- to 40-foot--tree of the custard apple family. Its large leaves, rusty when young, become bright green in summer and yellow in autumn. They give the multi-trunked tree a tropical look. In April and May, paw paw has unusual purple six-petaled flowers, according to the Lady Bird Johnson Wildflower Center (LBJWC). Large, aromatic edible fruit arrives in fall, usually falling form the trees as it ripens. Native Americans prized the fruit for its sweet taste. Birds and small mammals also consume it. The LBJWC recommends papaw paw as an ornamental tree where its fallen fruit won't be a nuisance. Planting a single tree will prevent the cross-pollination that leads to large fruit crops. Plant the trees in rich, moist, acidic soil (pH below 7.0 soil) and sun to shade. Avoid ingesting its toxic leaves, and be aware that some people may have severe digestive pain from eating its fruit. Desert willow (Chilopsis linearis) is a deciduous trumpet creeper family tree native across the southwestern United States. Its frequently twisted trunk has slender branches with narrow, willowy leaves up to 1 foot long. From April to September, the 15- to 40-foot tree produces fragrant purple--sometimes deep pink--trumpet-like 1 1/2-inch blooms. White, yellow or purple stripes often mark their throats. Most abundant early in the season, the flowers recur after rainy periods. Desert willow is a popular home garden tree, says the LBJWC. Plant in full sun and infertile, well-drained dry soil. Water only when dry, and fertilize sparingly. Black locust (Robinia pseudoacacia) is a pea-family tree consistently reaching 50--and occasionally 70--feet high. A stout tree, it has crooked, thorny branches with dark bark and feathery, greenish-blue foliage. In April and May, its drooping clusters of fragrant white flowers appear. The black locust cultivar ‘Purple Robe’ is a smaller tree, up to 40 feet high and 30 feet wide. Its clusters of fragrant violet purple flowers arrive in April, complementing purple-bronze leaves that become yellow in autumn. The flowers' nectar draws bees. Although promoted as thornless, some ‘Purple Robe’ trees do have thorns, according to the Missouri Botanical Garden. This tree performs best in rich, moist loam and full sun. It also grows in soils where other trees struggle. Remove root suckers promptly to keep it form spreading.